Adjustable MA Forex expert advisor is a customizable moving average EA that offers flexible tuning of the traditional 2-MA cross strategy. You can set different MA periods, MA types, minimum difference, stop-loss, take-profit, trailing stop and slippage. This expert advisor always opens position on cross and closes it on the next cross. The back-test of the Adjustable MA MetaTrader expert advisor has shown ~12.2% profit with ~12.6% maximum drawdown during a 6-year period. The used position's volume was set to 0.1 standard lots. The EA made 647 trades, of which 56.41% were profitable. 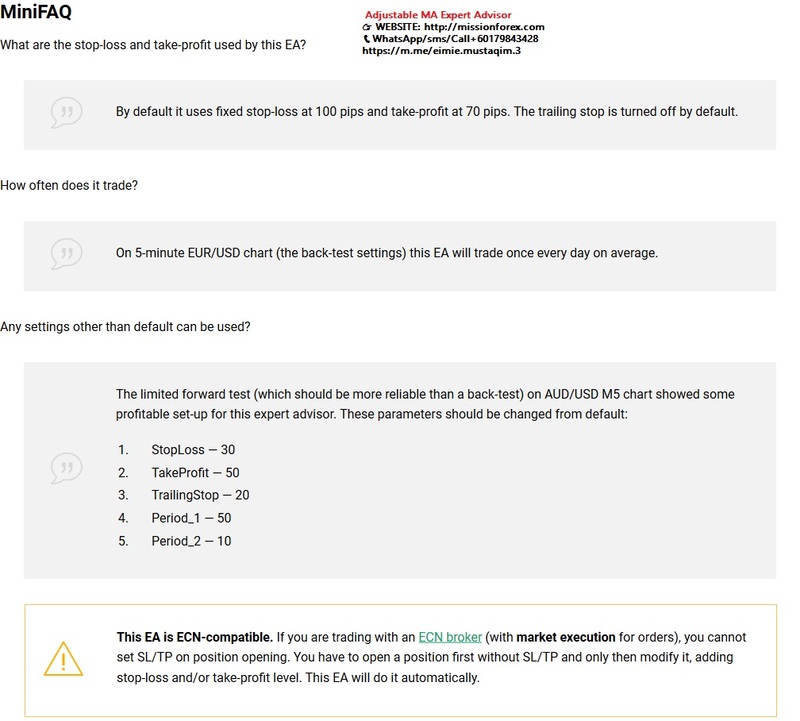 The default settings were used in this back-test on EUR/USD M5 chart. As you can see, the results are not very good. It is not recommended to use this EA on live account. The Only Thing you Need to Trade Forex Profitably! Reliable Trading with +85% Win Rate! Good for both Scalping and Day Trading! With the Dynamic Force Meter, you don’t need to worry about analyzing the market! - Your personal license will cover one demo account and one “live” account. - The files you’ll get is ZIP archive.